This is a very interesting surname, which is German or Askenasic, but has been recorded in England since at least the 18th century. 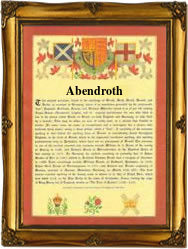 Recorded as Abend and Abendroth, it can be either what was known as an ornamental name, that is to say a name which may not have been literal in that it appears to translate as 'red evening', or it may have referred to an 'abendrot' or giant, and the subject of a number of medieval plays and fables. As such it may have been a theatrical name for one who played the part of a giant in the travelling theatres of the ancient times. Whatever the origin the surname is ancient being first recorded in a place called Barmen in Germany in the year 1250 with that of Heinrich de Abenrode, whilst Johannes Abend is recorded in Coln in 1470. In England the first recording is believed to be that of John Andrew Abendroth who married Elizabeth Halfpenny at St Martins in the Field, Westminster, on June 18th 1795, whilst George von Abendroth is also recorded in London in 1867, when he apparently married one Helena Scheuerman, by civil licence, although we do not have the exact date.